Fluorescent tubes have been the most common lighting source in offices and other indoor commercial spaces for decades. And there’s no doubt why – they’re bright, somewhat energy saving in the case of the newer T8s, and efficient. But while they’ve reigned number one for so long, there’s a new competitor in town – the LED tube. LED was in the past seen as too expensive a replacement. The technology was new, and the options on the market were limited. These days, though, LED is becoming as commonplace as halogen and fluorescent was in the past, and prices are becoming more competitive every day – no to mention the existence of government subsidised upgrades such as VEET. So, it’s clear the time has come to consider upgrading to LED. But what are the benefits, and how do you pick what’s best for you? No UV: LED lighting doesn’t emit the same harmful light radiation as Fluorescent, such as UV rays. 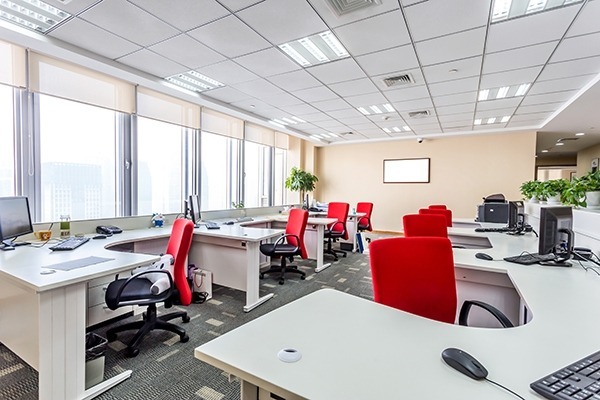 This reduces the discolouration that can be caused by UV rays to fabrics and signage, and also reduces eye strain to workers – especially important in office areas. Longer Lifespan: Like all LED technology, LED tubes last up to 50,000 hours, up to 4 times longer than T8 Fluorescents. This means you would save changing your lamp up to three times with LED. Safer Lighting: LED Tubes contain no mercury or glass, not only making them safer, but also less prone to fragility compared to fluorescent tubes. Energy Saving: LED technology uses 80% less energy than it’s counterparts, saving you costs on your energy bills. No Heat: LED Tubes produce little to no heat, whereas fluorescent needs high temperatures to produce light. This not only reduces the risk of a blowout but means the office won’t heat as much from the lights. It’s been shown that the change is so significant, that it will even reduce the need for air conditioning! Want to learn more about how LED is changing the lighting landscape? Read our LED page for more info.